This ACE location is at the corner of Fair Oaks Blvd and Sutter Ave. This walk-in location should have available parking for guests. Bus lines #23 and #25 of the Imperial Valley Transit line have a stop on Fair Oaks Blvd. Check IVT’s website for routes and schedules. Big Lots, La Bou’s Bakery & Café, Wells Fargo, Burger King, and Domino’s all are within walking distance of this ACE Cash Location. 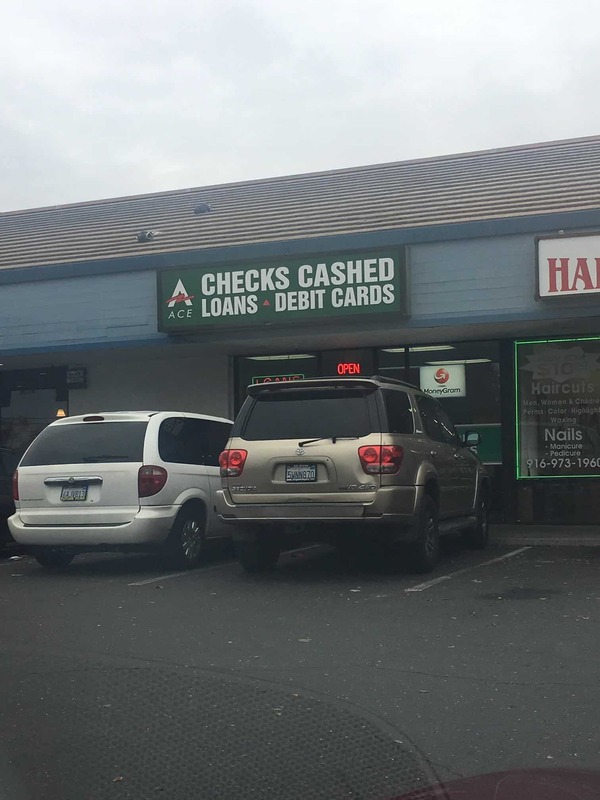 In the case for Carmichael residents looking for a quick and affordable way of getting funding, auto title loans powered by LoanMart are here to help. If you are a resident of Carmichael or the surrounding area and own a qualifying vehicle, consider applying for an auto title loan powered by LoanMart. A resident may even qualify to borrow as much as $30,0001 with terms ranging from 12 to 48 months, and in as little as a single business day3. Find out why auto title loans powered by LoanMart has so many customers under their belt. Collect your money as fast as the next business day3. Terms ranging from 12 to 48 months. Welcoming all unique credit types to apply1. You may be able to refinance an existing auto title loan if you qualify. Unlike traditional lenders, LoanMart does not define its customers by their credit score. They place far more importance on one’s ability to make regular monthly payments on time along with other factors such as a person’s equity value on their vehicle. Experience the difference by calling the toll-free number, going online and reaching out to a rep, or even go to the ACE Cash Express location in Carmichael. If a person does qualify, a representative will inform them about how to get their auto title funding!